Velvet #637 has green-to-fuchsia shimmer in a deep plum base. It dries to a satin finish. Satins from Dance Legend...it's kinda surprising that I only have one, right? I just got it too, even though the collection came out last year. If you've read any of my Dance Legend posts before, you know exactly what kind of gushing review to expect. This time's no exception. I adore this polish! I just wish it had a name instead of a number. It reminds me of Revlon Mesmerized, but I think I like it even more. It has that same brooding, "magical" look to it, but it doesn't need undies, isn't brushstrokey, and doesn't...grrr....bubble. The shimmer's coarser too, which gives it depth and twinkle and keeps it clear of frost territory. The contrast of purple base and green shimmer, the shift, the soft glow....lovelovelovelovelove! Like all satins, it's even better in person. This is two coats, which was kinda surprising. The first coat had me thinking it would need three or four for coverage, but it built up with just two. You know I -had to- gloss it up too! When I did, I fell in love with it all over again. Weirdly, the shift is easier to see in person when it's satin, but easier to photograph when it's glossy. It's stronger than photos really show. This is one of those polishes it's dangerous to wear while driving. I did manage to catch this sneaky shift, but it took some maneuvering. Bottom line: You need it....and I need #633, #642, and maybe a few others. 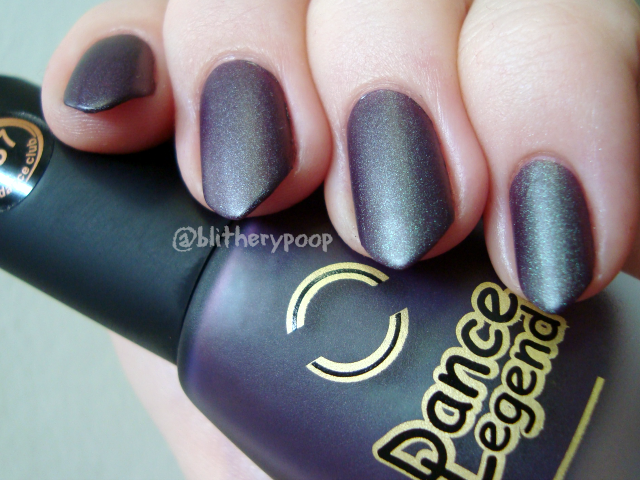 I bought it from Llarowe, but it's also on the Dance Legend site. They're on hiatus right now, but they should be back some time this month. Shipping to the US takes 6-10 weeks, but it is 400% worth the wait if you go that route. 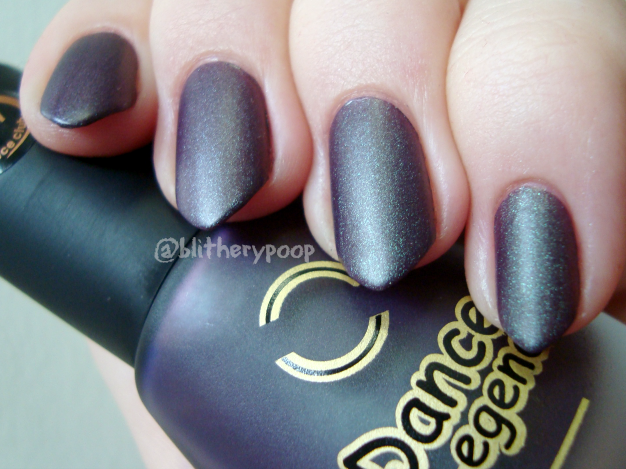 My Dance Legend love grows every time I try another of their polishes. Wow, that is amazing! I haven't tried any of their velvets yet. I've been contemplating buying this polish fr quite a while.I normally don't like matte polishes, but this one is gorgeous! You showed it beautifully. One small correction: the velvet collection didn't come out last year, it's one of the oldest from Dleg.